Last spring, local leaders from more than 50 towns in New England won a grassroots victory that echoed across the country when Texas gas company Kinder Morgan withdrew its application for a fracked gas pipeline project. Thanks to your support, Toxics Action Center helped community members along the Northeast Energy Direct pipeline pour themselves into revealing the project for what it was: an irresponsible, expensive plan to take public and private lands to export fracked gas for corporate profit. Even as community activists celebrated the cancellation of the Kinder Morgan pipeline, they did not rest. 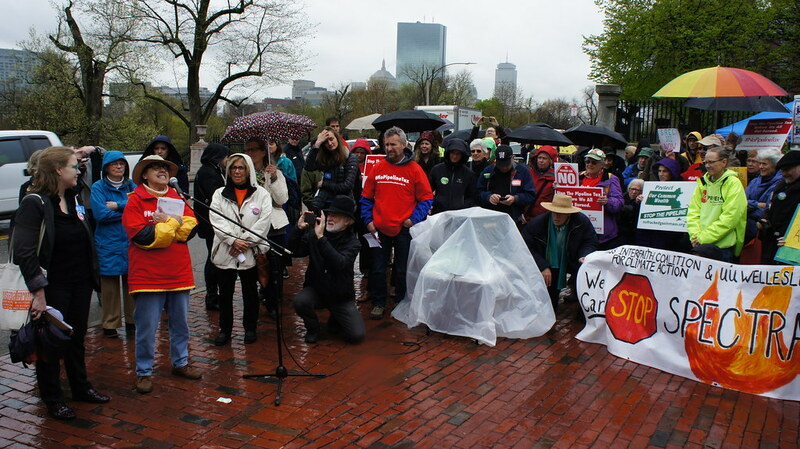 A week after the victory, Toxics Action Center’s Lead Community Organizer Claire Miller stood in the rain beside four fearless women as they addressed a large crowd gathered at the Massachusetts State House. Standing side-by-side for the first time, Maria Connelly from South Coast Neighbors United, Marla Marcum from Resist the Pipeline, Alice Arena from Fore River Residents Against the Compressor Station, and Bri McAlevey from No Sharon Gas Pipeline each described the threats their communities continued to face from other fracked gas expansion proposals. Together, Maria, Marla, Alice and Bri urged energy activists to use the victory as a springboard for ending all proposed gas development in the region and ushering in a new era of clean, local and renewable energy. And that’s exactly what happened. In Massachusetts, industry lobbyists opened the legislative session by pushing for a tax that would force ratepayers to pay for the very polluting infrastructure that threatens their towns and neighborhoods. Working with grassroots leaders and helping convene the increasingly powerful Mass Power Forward coalition, Toxics Action Center Campaigns helped generate hundreds of phone calls, emails and lobby visits to make sure an energy bill would not publicly finance more fossil fuels. With your support, the coalition also advocated for offshore wind and community solar, and the support of workers and communities impacted by the transition. Elected officials on Beacon Hill took notice. “Pro-pipeline” legislation did not gain traction, while the comprehensive energy legislation that passed at the end of July requires utilities to repair harmful gas leaks, makes the largest commitment to offshore wind in the country, and and moves Massachusetts forward on energy efficiency. In an even bigger victory, in late August the state’s Supreme Judicial Court ruled it was unlawful for regulatory agencies to pass the costs of risky pipeline projects onto ratepayers. The court’s decision seriously hurts companies like Spectra and Kinder Morgan, which were counting on subsidies from the public. The incredible movement of grassroots pipeline fighters that you helped build is stronger than ever and united across the region. There’s never been a better moment to show our states’ leaders that the people of New England are standing as one in opposition to dirty energy and in support of a just transition.